HFL can display newly received text or e-mail messages as well as 20 of the most recently received messages on a linked cell phone. Each received message can be read aloud and replied to using a fixed common phrase. A pop-up appears and notifies you of a new text or e-mail message. Select Read to listen to the message. The text or e-mail message is displayed. To discontinue the message read-out, select Stop. The system can only receive messages that are sent a text (SMS) messages. The message sent using the data services will not be displayed in the list. 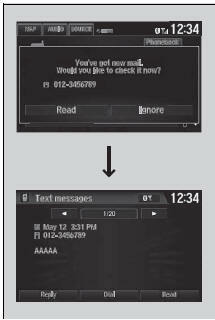 With some phones, you may be able to display up to 20 most recent text and e-mail messages. State or local laws may limit your use of the HFL text/ e-mail message feature. Only use the text/e-mail message feature when conditions allow you to do so safely. When you receive a text or e-mail message for the first time since the phone is paired to HFL, you are asked to turn the New Message Notification setting to On.